Southwest Research Institute is leading an engineering development effort to upgrade the reliability and performance of the U.S. Space Command's largest surveillance radar. 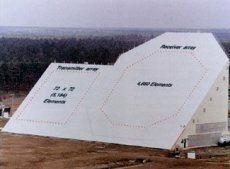 The world's first large phased array radar, the AN/FPS-85 was constructed in the 1960s at Eglin Air Force Base, Florida. Other large radars have been introduced since then, but the Grand Old Lady of the South, as the radar installation is known at Eglin, remains the nation's primary space surveillance radar because of its unsurpassed power and coverage. The AN/FPS-85 is a valued asset to the U.S. Air Force, but one with an aging technology base that must be supported into the future. For example, the on-site maintenance crew repairs an average of 17 radar transmitter units per day at an expense of $2 million annually, a figure that will rise as the vacuum tube market diminishes. Recognizing that maintenance costs could be reduced by reliability improvements, the Air Force contracted with SwRI in 1992 to study ways of improving the installation's transmitter array system. The beam formed by the phased array antenna extends from 155° to 205° in azimuth and is scanned at 35° elevation.